TRIUMPHANT FOR TWENTY YEARS. The Mauretania, built in 1907. In 1909 she logged an eastward record at an average of 25·89 knots and a westward record at 26 knots. Her time from Daunt’s Rock (entrance to Cork Harbour) to Sandy Hook (New York) was four days ten hours forty-one minutes, a record which stood for twenty years. After the war of 1914-18 she averaged 25·5, 25·6 and 25·7 on several passages. Her chief dimensions were: gross tonnage 31,938, length 762 feet and beam 88 feet; and her four sets of turbine engines developed 68,000 shp. She was broken up in 1935. Her sister ship was the Lusitania, sunk in 1915. Both belonged to the Cunard Line, now merged in the Cunard White Star Line. SAILING-SHIP races with China tea, and, to a less extent, with Australian wool, attracted almost as much attention in the middle of the nineteenth century as the Derby does to-day. The names of ships and of their captains were household words then, even with the lay public. Nowadays there is keen interest in the Blue Riband of the Atlantic, which is the subject of continual speculation. There is ample justification for this interest. Not only is the story of the record and of the struggle for its possession a fascinating one, but also on the practical side the competition has exercised great influence on the technical improvement of the steamer. developed rapidly when, after a lapse of time, owners made a real attempt to improve their speed; but the owners took few pains to make their performances known. Steam came in gradually, and the heavy coal consumption of the primitive boilers prevented any great effort to accelerate the service. 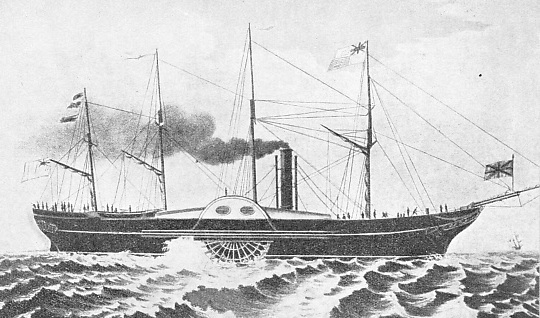 Brunel’s steamer, the Great Western, might be described as the first holder of the Atlantic record, for she undoubtedly beat her rival, the Sirius, to New York in 1838. But the race was more or less accidental, for the steamers started from different points. That they finished at New York on the same day, with the Great Western’s passage from Bristol five days shorter than that of the Sirius from Cork, surprised all concerned. The winner’s average was 8·2 knots, a figure that gives a starting line to the competition. BUILT IN 1849, the Baltic, one of the first fleet of the American Collins Line, which was begun with Government aid to capture some of the transatlantic trade for the USA. The Baltic and her sister ships were bigger than the contemporary Cunarders and were the most luxuriously fitted ships of their day. The Baltic had a length of 282 feet and a beam of 45 feet. Her tonnage was nearly 3,000, and her simple side-lever engines had an ihp of 2,000. In 1840 the Cunard Company began operations with four sister ships. It was that feature which made their success; individually many of their competitors’ steamers were far better, but they were a mixed collection. Neither the Cunard nor any other owner said much about speed, although the average of the Cunarders was much better than that of the sailing packets. On her maiden passage the pioneer Britannia averaged 8·5 knots between Liverpool and Halifax; but that was scarcely a fair test, because there were doubts about her coal consumption, and her people were naturally anxious to eke out their supplies. Later in the same year she did the eastward run from Halifax to Liverpool at an average of 10·56 knots. The Acadia, the best steamer of the original quartette, logged records of 9·25 knots westward and 10·75 eastward, later improving on the eastward performance by a fraction of a knot. The design of the pioneer class was only slightly improved in the Hibernia type; but the Hibernia herself averaged 11·67 knots eastward and the Asia, a rather bigger ship built in 1850, contrived 12·12 knots westbound, and slightly lowered the eastward record. In the ‘forties of last century the Americans were enjoying a high reputation for the speed of their sailing ships. When they were in such keen competition with the Cunard Company for the Atlantic business they naturally wanted to make the most of this, and built their packet ships for speed. They were remarkable vessels, but they could not equal the steamers in either sustained speed or general average of passage. In 1847 the Americans made their first serious attempt in transatlantic steam navigation with the subsidized Ocean Steam Navigation Company’s service. It was a daring move, for American shipbuilders and engineers had no experience of building such ships or their machinery. Thus it is not surprising that their design was faulty, their boilers too small to keep the engines in steam, and their paddles too deeply submerged. The result was that they failed to beat the Cunarders’ time, and eleven-days passages were their best. Although the Ocean Company’s steamers were a failure, the Americans were determined to have their share of the trade, and the Collins Line was begun with Government help. Mr. Collins himself had long experience with transatlantic sailing ships and built in 1849 the wooden paddle-steamers Arctic, Baltic, Atlantic and Pacific - ships whose tonnage of nearly 3,000 made them considerably bigger than the contemporary Cunarders. They were undoubtedly the most luxuriously fitted ships of their day, although with their straight stems and high sides they seemed ugly to those accustomed to graceful clipper bows. They cost much more to build than the estimate and the company had to call on the United States Treasury for further assistance; but they got the cream of the traffic. As new ships, the Baltic broke the westward record with an average of 13 knots, and the Pacific maintained the same speed to the eastward, although they had to burn nearly 100 tons of coal a day to do so, and their bunkers occupied a large part of their hulls. In 1852 the Arctic lowered the Pacific's eastward time with 13·25 knots. The Cunarders had to take second place until a sudden reversal of American political feeling towards the subsidy caused the complete ruin of the Collins Line and the withdrawal of its service. Meanwhile, a new rival had appeared, although it was not yet recognized as such; in 1850 William Inman started his steamship company. While the Cunard Company was building big paddlers he went in for smaller, but more efficient, iron screw steamers, which were sufficiently economical in fuel and space to permit him to carry emigrants. At first he was content to do this with tonnage of moderate speed. WITH STEAM AND SAIL. 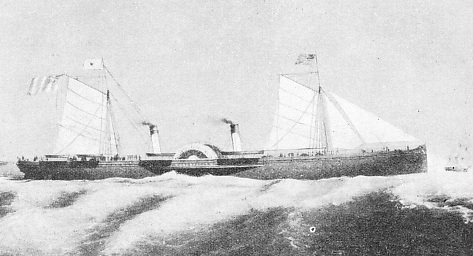 The White Star Liner Oceanic of 1871, having a gross tonnage of 3,707, a length of 420 feet and a beam of 41 feet, was longer and narrower than any ships designed for transatlantic service until that date. She was the pioneer ship of the White Star Line and the foundation of its success. Although this ship did not achieve any records, her sister ships did. The Cunard directors, determined that the company should regain its former position, built some remarkably fine paddle-steamers. The Arabia, the last wooden ship in the fleet, was a fast vessel in smooth water, but a failure on the Atlantic. Her speed dropped rapidly in rough water, her powerful engines shook her hull to pieces, and her boilers consumed 120 tons of coal a day. In the Persia, perhaps the most beautiful of paddle-liners, they turned to an iron hull. In 1856 she beat the eastward record with an average of 13·75 knots, although the Baltic’s westward record of 13 knots stood until the Scotia lowered it to 13·5 knots in 1864, having previously beaten the Persia on the eastward run with 14 knots. These fine ships were built largely because of danger which threatened from another quarter. In the ‘fifties Irish political influence was great, and the scheme to establish a service from Galway in Western Ireland to St. John’s, Newfoundland, and New York received such strong political backing that the Post Office gave the promoters a mail subsidy against the Cunard. Had they been able to do what they promised it would certainly have been a good bargain. Basing their estimates on the achievements of the cross-Channel packets, the promoters undertook to run to St. John’s in six days and to New York in seven. To the former port they would carry telegraphic messages to be sent over the land wires, as the Atlantic cable was not yet working. For this service they ordered four paddle-steamers of about 3,000 tons at a cost of about £95,000 each. It was estimated that their powerful engines would drive them at 17·5 knots in smooth water if they were given the lightest possible hulls. Disaster came as soon as they ventured into water which was not smooth. The Connaught was burned out when she was on the point of foundering in the Atlantic, the Columbia took seventeen days on her maiden voyage instead of the contract seven days, and arrived leaking so badly that she had to be reconstructed, and the Hibernia had to be rebuilt before she could start out at all. The unfortunate company collapsed. THE FIRST ATLANTIC RECORD was claimed by Brunel’s steamer, the Great Western, which beat her rival the Sirius to New York in 1838, with an average of 8·2 knots, though the race was a fortuitous one. The Great Western had a length of 212 feet, a beam of 35·3 feet, and a tonnage of 1,340. Her paddles were driven by two simple engines working with a steam pressure of 15 lb. Then the competition of the Inman Line began to develop. William Inman had been steadily improving his steamers and appreciated the publicity value of the Blue Riband just as much as Collins had done. His first success was in 1867 with the City of Paris, making the shortest westerly passage, which was given great publicity in Europe and the United States, although it was really due entirely to the short route selected; the average speed was slightly less than that of Scotia. But in 1869 the City of Brussels undoubtedly beat the Scotia’s best eastward time by half a knot, averaging 14·5 knots. There was great rivalry between the Cunard and the Inman Lines in the ‘sixties, and the latter’s screw ships certainly had the advantage over the Cunard’s paddlers. In 1867 the Cunard screw vessel Russia secured the eastward record with an average of 14·22 knots, but within a month she had lost it to the City of Brussels with 14·66 knots. In 1870 another competitor appeared in the White Star Line. Its Atlantic liners were built on an entirely new principle, on which Mr. Edward Harland, of Harland and Wolff, the Belfast shipbuilders, staked everything and made his reputation. These ships were very long, arranged internally on a novel principle and, with their single funnel and four masts, introduced a new rig. In 1872 the Adriatic beat the westward record with an average of 14·5 knots, and in the following year Baltic took the eastward average up to 15 knots. The rivalry thus changed to one between the Inman and White Star Companies, the Cunard letting the record go and building inferior ships for a time. This caused a bitter newspaper controversy. Both companies built new tonnage, of which the White Star Germanic and Britannic were the most conspicuous ships. Eastward, the City of Berlin averaged 15·25 knots in 1875, the Germanic contriving 15·75 knots in the following year, only to lose the record to her sister the Britannic with 16 knots in the same year. Westward, the City of Berlin’s 15 knots logged in 1865 was beaten by the Britannic’s 15·25 in 1876 and by the Germanic’s 15·5 in 1877. In the same year the Britannic beat her sister on time alone, not in average speed. Noticing the success of the Inman Company in breaking into the saloon business, the Guion Line, which also had originally carried on a purely emigrant business, made its first attempt to build record-breakers in 1872 with the freak steamers Montana and Dakota. They were, perhaps, the most curious ships put on the Atlantic, both in hull and in machinery. The hull had a huge tumble-home recalling that of an old-fashioned battleship. The machinery included water-tube boilers - the first to be tried in big ships - working at 100 lb pressure. The engineers hoped that these ships would contrive 17 knots with remarkable economy, but they were disappointed. THE IRISH CHALLENGE. In the ‘fifties a scheme was broached in Ireland to establish a fast service between Galway in Western Ireland and St. John’s and New York. For this service orders were placed for paddle-steamers of some 3,000 tons at a cost of about £95,000. It was estimated that they would be capable of 17½ knots. The ships were not successful. The Connaught was destroyed by fire and her sister vessels proved to be failures. The Montana disabled all ten of her water-tube boilers on her passage from the builders and was refused a passenger licence until they had been replaced with something safer. Both engines and boilers were constantly breaking down and neither ship could approach 17 knots, although the coal consumption was colossal. The Dakota was wrecked in 1877 and the Montana in 1880, and the company was well rid of them. Despite their failure, Mr. S. B. Guion, who controlled the company, persisted in his ambition, but wisely went to one of the best shipbuilders in the country, John Elder & Co, who later became the Fairfield Yard. In 1879 they built him the Arizona, the first ship to be nicknamed the “Atlantic Greyhound” and the first to be propelled by a three-crank compound engine. Her design was daring, but Sir William Pearce, the head of Fairfield’s, had faith in himself which was amply justified. In 1879 the Arizona secured the eastward record with a fraction of a knot more than the Britannia’s average, and in the following year she equalled her speed westward, securing a slightly better time by the shorter route. 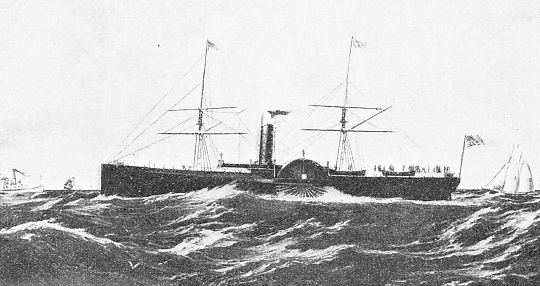 The general principles of her design were followed with slight improvements in the Alaska, which secured both records in 1882, averaging 16·75 knots eastward and 16 westward. Made bold by the publicity which the Guion steamers’ records had obtained, a third emigrant company, the National Line, determined to try the same policy and built the America, a particularly beautiful clipper-stemmed ship which brought the eastward average up to 17·5 knots. But with this record her luck ended. The saloon business could not support so many crack ships as had been put on service, and the National Line made the mistake of attempting to run its first-class service with the America only. No unbalanced service has yet succeeded on the Western Ocean and, losing large sums on her operation, the line eventually sold her to Italy for conversion into a cruiser. Meanwhile, the third Guion liner, the famous Oregon, had been delivered, a further improve-ment on the Alaska. In 1884 she secured both records, the eastward with an average of 18·5 knots and the westward with 19. But the company’s receipts were not sufficient to pay the instalments due on the ships. The Oregon, which was widely discussed as the first ship to reach New York in less than a week, was transferred to the Cunard Line, under whose flag her career was shortened by a collision, in which she sank. 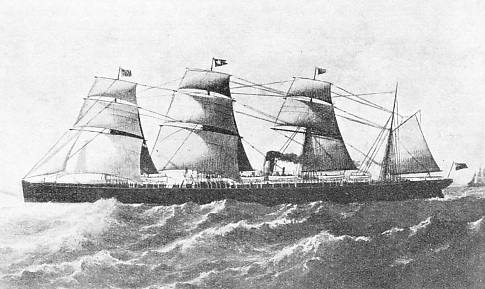 A HANDSOME CLIPPER-STEMMED VESSEL, the America, built in 1884, captured the Blue Riband of the Atlantic for the National Line with an eastward record of 17½ knots. Proving uneconomical to run, she was sold to the Italian Navy for conversion into a cruiser. The America had a gross tonnage of 5,528, a length of 432 feet, and a beam of 51 feet. She was driven by three crank compound engines of 8,300 ihp. During these developments, the Inman Company had not been idle, but in 1881 took delivery of the beautiful City of Rome, specially designed to regain the record. Had the original design been adhered to it is probable that she would have done so, for the substitution of steel for iron in her hull had greatly reduced its weight. But supplies of shipbuilding steel were short, and to obtain delivery the company sanctioned the use of a large proportion of iron. Thus her hull was much heavier than had been calculated. As she could neither make her designed speed nor carry her guaranteed cargo, she was thrown back on to the hands of her builders, who put her under the management of the Anchor Line. She was a popular passenger ship and her speed improved later, but she was never a record breaker. In 1884 the Cunard Company had come back into the record class with the sister ships Umbria and Etruria, going to the Fairfield Yard for them as the Guion line had done. The transfer of the Oregon to the Cunard flag robbed these two ships of their principal purpose, but they were remarkably successful and popular. As with the White Star Britannic and Germanic ten years previously, they exchanged both records backwards and forwards between them by fractions of a knot; but finally the Etruria secured both westward and eastward records with an average of 19·5 knots. THE FIRST ATLANTIC LINER TO EXCEED 5,000 TONS was the White Star Liner Germanic. In 1876 the vessel covered the eastward passage at an average speed of 15·7 knots. The ship had compound tandem engines of 5,100 ihp. Her sister ship was the Britannic. It was in the ‘eighties that the possibilities of the Southampton record began to assume shape. Liners between the United States and the Continent had called at Southampton since the ‘forties. But they were of moderate speed, and it was not until the French and German companies, Compagnie Generale Transatlantique, North German Lloyd and Hamburg-Amerika, renewed their fleets in the ‘eighties that their speed began to approximate to that of the Liverpool ships. The Southampton record was considered as distinct from the Liverpool record on the Continent, but for the time being it did not attract any great attention in England and its publicity value was confined to the European trade. In the ‘eighties, the threatened international situation provided the opportunity of development in another direction. A number of ships were taken as auxiliary cruisers, the Oregon proving herself faster than any regular cruiser at manoeuvres. But they cost so much that the Admiralty determined to have a regular arrangement with the ship owners and to pay them a subsidy for crack liners which, it was then believed, would make ideal cruisers in war time. The White Star Company first took full advantage of this subsidy arrangement, which eased the cost considerably, and it made the most of the advertisement afforded by the inspection by the German Emperor of the Teutonic as an auxiliary cruiser. The Inman Line immediately followed suit. The result was the construction of the White Star Teutonic and Majestic, and of the Inman City of Paris and City of New York, in 1888 and 1889. These four ships differed widely in appearance, but were evenly matched in size and speed. Rivalry between the four lasted from 1889 to 1893 and ended in the westward record being held by the City of Paris with an average of 21 knots and the eastward by the City of New York with 20. When the Inman Line failed the remnants of its fleet and business were taken over by the American Line, which transferred the terminus to Southampton with these two ships. They thus drew attention to the Southampton record. This had been lowered by the Hamburg-Amerika ships in the late ‘eighties and early ‘nineties and was held by the Furst Bismarck until the Inman ships were transferred. In 1893 the Cunard Company built the Campania and Lucania at the Fairfield Yard. A fight for the record followed, ending in the Lucania holding both, the westward with an average speed of 21·85 knots and the eastward with 22. IRON INSTEAD OF STEEL in the hull of the City of Rome meant a heavy ship and a failure to break the record. Built in 1881 for the Inman Company, the City of Rome was designed to regain the Blue Riband, but, as supplies of shipbuilding steel were short, the company had to sanction the use of a larger proportion of iron. Her gross tonnage of 8,144 made her the biggest ship of her day except the Great Eastern, and her crank compound engines had an ihp of 11,500. Then came what was, perhaps, the most dramatic incident in the history of the Atlantic record. The North German Lloyd had been beaten by the Hamburg-Amerika and was in a serious position. After long consideration and discussion the directors decided on the daring step of risking everything in the construction of the crack ships of the Atlantic. The German Government was anxious to encourage native shipbuilding and the company took the opportunity of fixing a hard contract. Two German shipyards were to risk building two vessels of a type which they had never considered before; the trial trip was to be the maiden crossing of the Atlantic and the speed conditions were onerous. To the astonishment of the world, which had not taken German shipping and shipbuilding seriously until then, the Kaiser Wilhelm der Grosse came close to the Cunarder’s average speed and contrived to log a time record. The Kaiser Friedrich, on the other hand, failed by a fraction of a knot and was thrown back on to the hands of her builders for fifteen years. It was not long before the Kaiser Wilhelm der Grosse won both records with an average of 22·7 knots westward and 22·8 eastward. 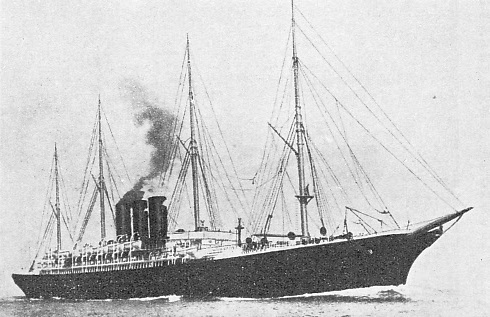 Meanwhile, in 1900 the Hamburg-Amerika company built the record-breaking Deutschland, which was a remarkably fast steamer, but did not maintain the high average, voyage after voyage, of her Bremen rival. After long consideration the directors decided to leave the record alone and to build for moderate speed with the largest size and the greatest possible measure of comfort. A similar decision had already been reached by the White Star Line, which never attempted a record-breaker after 1889. The Deutschland, accordingly, had her power drastically reduced and became the 18-knot cruising yacht Victoria Luise. A GERMAN SUCCESS. 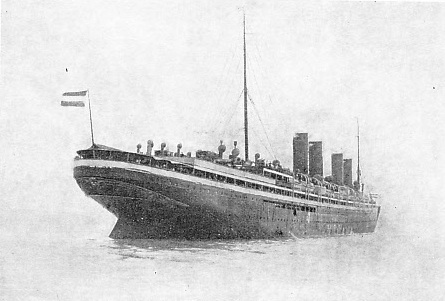 The North German Lloyd Line of pre-war days, the Kaiser Wilhelm der Grosse, once held both Atlantic records with an average of 22·7 knots westward and 22·8 knots eastward. The ship had a length of 625 feet, a beam of 66 feet and a gross tonnage of 14,350. Her two four-crank triple expansion engines developed 32,000 hp. Employed as an auxiliary cruiser in the war of 1914-18, she was caught when short of fuel by a British cruiser and sunk by gunfire. But there was no doubt as to the success of the policy of the directors of the North German Lloyd. In the year after they had won the record their ships carried 25 per cent of the total number of transatlantic passengers. They improved on the Kaiser Wilhelm der Grosse design with the Kronprinz Wilhelm, which won the westward record with 23·09 knots, but the eastward on time only. The next ship was the Kaiser Wilhelm II which also was successful on time only, and the fourth was the Kronprincessin Cecilie, which had no time to get into her stride before the record had passed into the hands of the Cunard Company again. 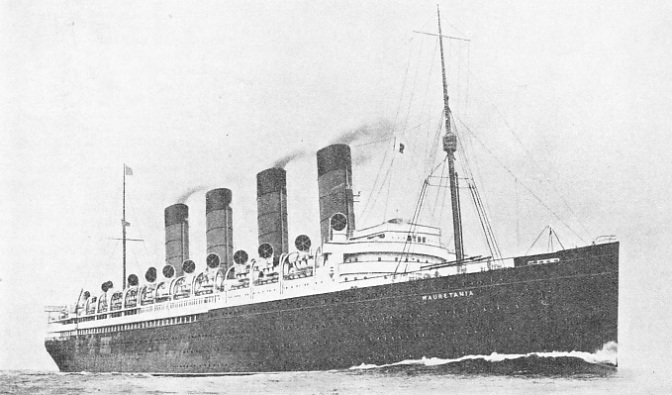 The triumph was attained by the Lusitania and Mauretania. These ships were built in 1907, with the assistance of the Government to keep the British flag in a predominant position, despite German success and the immense financial operations of the late Mr. Pierpont Morgan, who had founded the International Mercantile Marine group. The Government lent the company money on easy terms to build the two ships, which were far bigger than any previously considered. It also paid the company an annual subsidy to have them available as auxiliary cruisers, a purpose for which they proved unsuitable when war broke out. The Lusitania was completed first. Nursing her turbine engines, which had never before been fitted into an express steamer, she immediately won the eastward record with an average of 23·61 knots and, having found her form, the westward with 24·25. That was in 1907; two years later she brought her average westward speed up to 25·01. The Mauretania was a little later and took longer to get into her stride, but in 1909 she logged an eastward record at an average of 25·89 and a westward at no less than 26·06 knots. Her time from Daunt’s Rock (entrance to Cork Harbour) to Sandy Hook (New York) was four days ten hours forty-one minutes, a record which stood for twenty years. With age her speed increased; after the war of 1914-18 she averaged 25·5, 25·6 and 25·7 knots on several passages, while, racing to the assistance of a ship in distress in appalling weather, she worked up to over 29 knots. A LUCKY ACCIDENT. 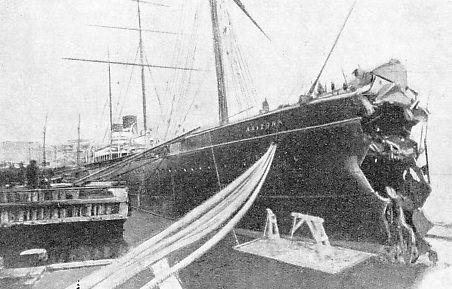 The Guion Company’s first successful record-breaker, the Arizona, was built in 1879, and owed her success largely to a mishap. When a new ship, she collided bow-on with an iceberg, but succeeded in making St. John’s, Newfoundland, in the condition illustrated. The Atlantic travelling public decided that a ship so excellently built that she could withstand such a collision must be safe, and accordingly patronized her. The Arizona was the first vessel to be propelled by three-crank compound engines across the Atlantic. Her gross tonnage was 5,147, and she had a length of 450 feet and a beam of 45 feet. The indicated horse-power was 6,300 and the steam pressure 90 lb. The early days of the war proved that the express liner was useless as an auxiliary cruiser because of the difficulty in keeping her in coal, and when matters were readjusted after the Armistice there seemed to be little chance of the owners obtaining Government help on that score. It was also generally believed that the post-war traveller would demand the most reasonable fare possible, even if the ship were slower, and most companies built moderate tonnage on that assumption. 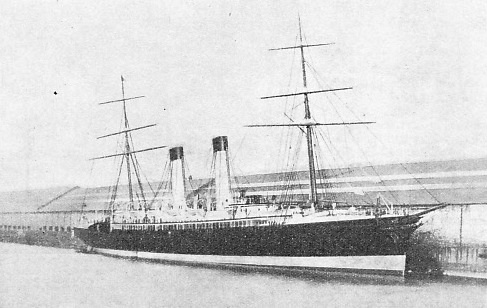 But the North German Lloyd, bent on repeating the success of 1897, built the Bremen and the Europa to regain the record. Their design embodied a number of entirely novel features. They were completely successful; in 1929 the Bremen averaged 27·9 knots eastward and the Europa 27·91 knots westward. The influx of American tourists to Europe by the northern route did not suit the Italians. With the assistance of the Government, who insisted that competition within the flag should be abolished and that the Italia Line should be formed by a combination of the rival Italian companies on the Atlantic run, they built the Rex and the Conte di Savoia, the first record-breakers that they had ever considered. When the Rex logged the first Italian record with a westward average of 28·92 knots, with excellent air connexion at Gibraltar, the service attracted many American travellers. AN ITALIAN RECORD-BREAKER. With the assistance of the Italian Government, who insisted that the Italia Line should be formed by a combination of rival companies on the Atlantic route, the Rex and Conte di Savoia were built. The aim was largely to attract the American tourist traffic to Italy. The Rex, built in 1932, logged the first Italian record with a westward average of 28·9 knots. Her gross tonnage is 51,062, and she carries 443 first-class passengers, 367 second-class, 402 tourist and 820 third. Her geared turbine engines have a shp of 120,000. The diversion of the American trade to the southern route was as unpalatable to the French as the northern tendency had been to the Italians. State aid was, therefore, readily given to the Compagnie Generate Transatlantique to build the great liner Normandie, described in the chapter beginning on page 73. She gained the Blue Riband on her maiden voyage by a large margin. From Southampton to New York she made a mean speed of 29·53 knots. The highest speed recorded on this run was 31·37 knots. On the eastbound voyage her mean speed was 30·34 knots, the highest recorded speed being 30·91 knots. BUILT FOR SPEED. The North German Lloyd liner Bremen averaged 27·9 knots on an eastward voyage across the Atlantic in 1929, and her sister ship, the Europa, averaged 27·91 knots westward, thus regaining the Blue Riband for Germany in that year. The Bremen (above) has a gross tonnage of 51,656 tons, and a passenger capacity of 739 first class, 596 tourist and 830 third. Built in 1929, she has a length of 898 feet and a beam of 101·9 feet. The Europa has a gross tonnage of 49,746.